I had just about given up on perfumes once I learned about all of the questionable ingredients in the perfumes and body sprays I had been buying. Things like propylene glycol, synthetic chemical fragrance blends, and a whole bunch of other unpronounceable ingredients that would make my spell-checker go crazy if I tried to type them out. Just look up the name of your favorite perfume into the Environmental Working Group’s Skin Deep Cosmetics Database and see how toxic it really is! I was pretty shocked when I realized that my “refreshing” perfumes and body sprays with their “natural and botanical extracts” were actually full of carcinogens and other toxic chemicals! After ridding the shelf of doom in my bathroom of toxic products and trying to freshen and purify the air indoors, I didn’t want to be putting those chemicals on my body, breathing them in, or filling the air inside the house with them. So, I did without the perfume for awhile, but I missed being able to put on something nice-smelling every morning. 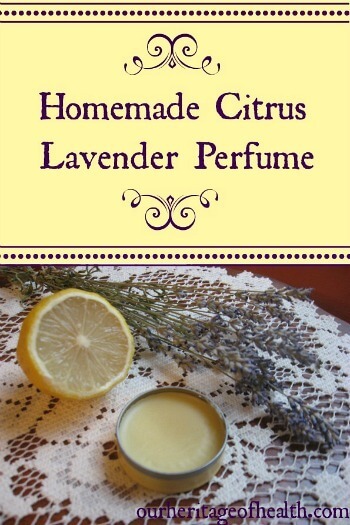 But then when I was paging through my copy of The American Frugal Housewife written by Lydia Marie Child in 1833, I found a recipe for a homemade citrus lavender perfume and decided to try making my own. After finding this post at Crunchy Betty, I was inspired to use Mrs. Child’s recipe to try making a solid perfume rather than a liquid one. I love how convenient and portable it is – so much easier for traveling than a liquid perfume would be. Just stick the container in your purse and you’re good to go! The idea of making my own perfume seemed kind of complicated at first, but once I actually tried it, I realized that it’s actually pretty simple. And it only took me about twenty minutes from start to finish. Not bad at all considering that it would have taken longer than that to go out to a store and buy some. And making your own perfume is much, much cheaper too since you only use a few teaspoons of beeswax and carrier oil and a few drops of essential oils. Note: Just like with real food, quality counts when it comes to essential oils, too. You can learn more about the essential oils that I use and recommend here. You can also play around with the amounts of each oil or try substituting a different essential oil if you don’t have the ones listed above. I decided to use sweet almond oil for my carrier oil because I had some on hand and it seemed more authentic to the period of this recipe. I’ve seen several mentions of almond oil in 19th century books and magazines, but I’ve never seen a mention of jojoba oil. If you don’t have almond oil available, though, jojoba oil would work just as well. In a separate cup from the essential oils, I measured out two teaspoons of almond oil. Measuring the oil out ahead of time saves you from rushing around once your beeswax is melted. If you have beeswax pellets, simple measure out 2 tsp and melt them in a small saucepan over medium-low heat. If you have a solid block of beeswax, I’ve found that the best way to get the two teaspoons of beeswax was to grate off enough beeswax to have a firmly packed two teaspoons (just like the way you would pack brown sugar in a measuring cup.) 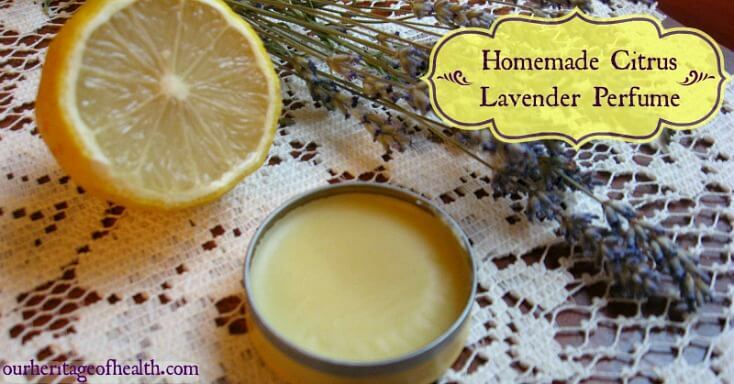 If you find that you don’t have quite two teaspoons, you can just shave off a bit more beeswax and add it to the pot. If you have more than two teaspoons, just save the extra for another project. Once you have two teaspoons of melted beeswax, add the two teaspoons of carrier oil to the pot and stir around a bit until they are combined. Then take the pot off the burner and quickly (quickly!) add in the essential oils. Stir for just a bit until combined. As quickly as possible, pour the mixture into your container. Cover it, let it rest for about 10 minutes until it is set, and then enjoy! The scent of this perfume is very balanced. The main note is definitely the citrus, but the lavender gives it a nice depth. It’s slightly sweet too from the almond oil and beeswax. The citrus scents are energizing, but the lavender is relaxing, so they balance each other out quite nicely for the perfect blend of morning aromatherapy. I’m so glad I decided to try making my own perfume. For a short amount of time and a small amount of money, I have my own unique perfume that is non-toxic and completely natural! This post is linked to Sunday School at Butter Believer, Scratch Cookin’ Tuesday at Granny’s Vital Vittles, Frugal Days, Sustainable Ways Wednesday at Frugally Sustainable, Wildcrafting Wednesday at Mind Body and Sole, Natural Living Link-Up at Jill’s Home Remedies. Thank you so much for sharing! I’ve been wanting to do something like this for awhile and your instructions are very detailed. I’ve never been able to wear perfume because of allergies and I’ve always suspected its because of the chemicals. I found you over on Simple Lives Thursday and am your newest follower! This is really cool! I love making my own stuff, but haven’t made a full-on perfume yet. Thanks for the recipe. Some of the links in this article are no longer valid. Can you please fix them? Thank you for letting me know about the invalid links! They should all be fixed now. This is such a great idea and a really simple recipe! I used to make body oil from essential oils and olive oil, it leaves your skin really smooth and it’s natural. Can I use avocado or fractionated or regular coconut oil instead? I don’t have almond or jojoba oil. Thanks! I’ve never tried either of those, but yes, I think they would probably work just fine for this recipe. How long is the shelf life of this once it’s all put together? I actually used mine up long before I even had to worry about the shelf life, but it should keep well for several months. If it’s stored in a cool, dry place, it should be fine for at least 6 months. I’ve always used essential oils for body sprays. They work great and you can get them in almost any fragrance you want. Yes, I love the variety to choose from and the fact that they are natural! I never received an email from you so that I could confirm my email. Hi Pamela, I’m really sorry about that! There might have been a glitch in my email service. It’s also possible that the confirmation email might have ended up in your spam folder since that sometimes happens with newsletter emails. If you don’t see it in your spam folder, I can see if there’s a way to add your email. Hi, should we use the cold-pressed oil or normal one? it’s kinda hard here to find a cold-pressed coconut oil :(. Thanks for your post :). Either type of oil would be fine for this recipe, so use whatever is the most available to you. Just a heads up, though, that the consistency of coconut oil can vary depending on the temperature, which is why I usually use either jojoba or almond oil when I make this recipe. Coconut oil should still work fine, but just be aware that in the winter time your perfume might be very solid and in the summer time it will be softer. Hi, your recipe are simple but very details. i will try during the weekend and let you know the outcome. This was such a great idea. As a guy I typically use a body spray, however I never put it on my skin due the aluminum content of these types of deodorants/colognes. I really liked this idea and will be doing something similar to create something that is safe for the skin and keeps me smelling fresh! Yes, it’s really nice to have something to help you smell nice but not have to worry about whether or not it’s safe for your skin! And you can have some fun playing around with different essential oils, too, to find a scent that you like.